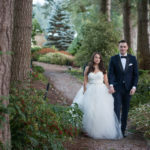 This past December, I had the pleasure of photographing Jared & Kanna on their wedding day at The Gardens At HCP (Horiticulture Centre Of The Pacific) in beautiful Victoria, BC. It had snowed earlier that day and we had just a few hours of daylight to work with. I admired this couple as they were happy to brave the cold in order to get the perfect shots… and that we did! The wedding venue was truly spectacular with a variety of gardens and the beautiful Couvelier Pavilion. This was definitely one of my favourite winter weddings to photograph on Vancouver Island. Congratulations to Jared & Kanna!